Exclusive The Walking Dead artwork by Charlie Adlard comes with the Collector's Edition. 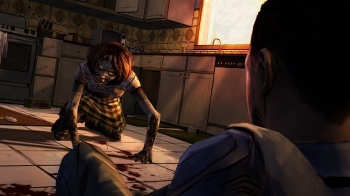 Telltale's The Walking Dead will be compiled onto one disc for retail sale December 2012, but up till now not much has been said about a Collector's Edition. Now details of that Edition have been released, but fair warning: if you want it, go to GameStop, as it's exclusive to that retailer. The standard Xbox 360 or PS3 disc compilation features all five episodes of Season One, and is available for $29.99. The Collector's Edition has the disc, plus The Walking Dead Compendium One graphic novel collection with exclusive cover art from Charlie Adlard - the series' artist since 2004 - plus a box decorated with more Adlard art to keep it all in. The whole shebang will set you back $69.99. Telltale says that the Collector's Edition will be extremely limited, and that this version of the Compendium will remain unique to this release; it won't be sold elsewhere, and is due December 4th. Only pre-order GameStop customers will get it, so if this is something you want, don't walk: run!